Distributor: License by Media Blasters, World Event Productions expired. Notes: Adapted from the Japanese series Hyakujuou Goraion (Hundred Beast King Go-Lion). The New Adventures of Voltron, while identical in appearance to the original series, is actually American/Korean produced. In the late 1990s, World Events Productions produced a CGI series, Voltron: The Third Dimension, and followed shortly thereafter with Stealth Voltron. Voltron: Vehicle Team is based on another unrelated title, Kikou Kantai Dairuger XV. Ages ago in the Denuvian Galaxy, the planets lived in peace under the safeguard of the powerful robot warrior Voltron, until one day, the evil witch Hagar split Voltron into five separate robot lions, sending them to slumber in the bowels of Planet Arus. Years pass, Hagar has now made the evil King Zarkon her puppet, and they are violating the mandates of the Galaxy Alliance, terrorizing and seizing control over several lesser planets. Five young officers are sent to enforce the will of the Alliance, only to be captured and beaten. They narrowly escape, and crash land on Planet Arus, where a princess in distress and her struggling court appeal the men to reawaken the sleeping robot lions and revive the mighty sentinel Voltron. Is there anything I can say in this review that would have you take it seriously? No? Then I will give up now. Voltron is more a product of nostalgia for us than anything else. Most fans new to anime (and by "new" I mean being aware for less than a decade) would watch one episode and proceed to claw their eyes out and shove daggers into their ears. It does nearly everything that "purists" love to hate. The series dates back to the 1980s, so it already has grainy animation and dated character designs working against (or in, if you're like me) its favor. The colors are faded, the artwork inconsistent, and the movements jerky at times. It doesn't help matters much that, this being an American dub from the mid-80s, it underwent a hack job in the tradition of several other childhood favorites. What makes Voltron stick out is that the editing job was awkward and noticeable, not to mention obvious and inconsistent. But unlike hackjob nightmare CardCaptors, at least Voltron manages to uphold the adventurous spirit of the original. In fact, the atrocious production quality is forgiveable, because Voltron is, while campy, admittedly more fun than the run-of-the-mill Go-Lion original. 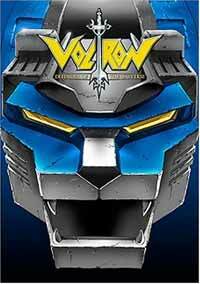 In fact, the popularity of Voltron in the United States dwarfed Go-Lion, which quickly fell into obscurity in Japan. As a result, World Events Productions, Ltd. actually bought the entire series from Toei Animation in order to produce more episodes featuring the same characters, long after the Go-Lion series came to an end. It might have something to do with the cheezy fanfare whenever Voltron appears, or maybe the dated slangy dialogue is to blame. But you can tell the producers were having fun, and the child in you will find it contagious. Speaking of dialogue, while some of the voices and lines are outright hilarious (as in awful), the recycled voice actors (some playing up to three major characters) are distinctive and capture the cliches marvelously. Most noticable is Michael Bell's performance as the rebellious hot-shot Lance--he somehow manages his slangy lines laced with attitude without sounding forced or trite. In fact, Michael Bell is more of a natural than most modern-day anime specialty voice actors. When putting all the pros and cons together for this series, it is hard to determine where to rank it. For all of its apparent flaws, we either are embarrassed to admit it is entertaining, or, basking in the pride of our old-school retro-ness, we immediately jump to the front of the line when the DVDs go on sale--because, y'know--we "get it." But just like you can never expect me to "get" the appeal of Transformers, nor do I expect everyone to "get" Voltron. However, it certainly fills the gap left by the under-represented subgenre of "sentai" anime out in the States. For anyone to wants the "complete" anime experience, opening up the time capsule and sneaking a peek at Voltron is absolutely necessary. Who knows? You might be entertained. At the very least, you can see how far we as an entertainment subculture have come. Recommended Audience: Best for kids, though teens and young adults will get a great laugh over the poor edits and dubbing. Very dated, but we still love Speed Racer, don't we? Voltron: Defender of the Universe © 1984 World Events Productions, Ltd.